…….. but only on the “Easy” setting! Yes. We went and did it. As it was Kendo’s 40th birthday on Friday (HAPPY BIRTHDAY Mr K!) 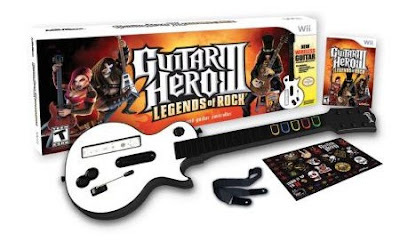 we (well, he) went and bought a copy of Guitar Heroes III for the Wii. Oh My Goodness. This just might be the most fun you can have with your clothes on. Seriously. We spent all of Friday night, and Saturday night (till 1am!) playing the damn thing. I managed to get through and complete all the songs on the Easy setting (including a guitar battle with Slash, which was just COOL!). I think Kendo was secretly (or not so secretly) waiting for me to unlock all the songs so he could just get on and play them. Typical. Letting the woman do all the hard work while you reap the benefits! I’ve only managed 2 songs on the Medium level, but I haven’t spent so much time on that, and it is WAY harder. Especially if you don’t really know the songs well (you can wing it on Easy, not so much on this level). Ah well, it’s not like I have a social life. Plenty more time for the rock legendness to continue. I’ve been skirking a bit on my “My Freedom” blog prompts. I blame the Guitar Heroes. I’m also a little behind on my layouts (Slash’s fault, I tell you). I have half of the first layout for last weeks prompt done (one on Inspiration) and I have a good idea of what I’m doing for the second one (Aspirations). I didn’t manage to get to these last night because I had a mad dash finishing off some last minute projects that had deadlines. I’m going to be all scrapping, all the time tonight though. I promise. So. My first job. Blimey, that was a long time ago. I started with a Saturday job when I was 15 years old. I worked as a waitress in a café-come-deli in the town centre. Basically it was waiting tables, cleaning, making coffees, teas, hot chocolates etc. I worked there with a friend of mine from school, which was cool as we at least had company for the day, and boy, was it a long day. We used to work from 8.30 until 5 with a 30 minute lunch and two 15 minute breaks. All for the princely wage of £11.00 per day. Strangely though, we always had enough money to have a decent Saturday night out on that (usually involving having bought a new item of clothing too). I wonder why my money these days doesn’t stretch as far as that £11.00 did? Hmmmmm. I have actually accomplished something other than Guitar Heroes practice this weekend. We decided it was about time Egg’s room had a revamp from cutesy nursery into proper big boy room. Much painting, wallpaper, cussing and a bad back later and it’s been transformed from yellow with cute jungle animals into denim blue with white woodwork. It looks really good, if I do say so myself ;) and I think Egg likes it. Well, he pointed at the wall and said “Blue, blue, blue” so I think he gets it. We had a bit of a shopping expedition yesterday in search of a Bob The Builder duvet cover (you have no idea how hard that was to find! ), some new sheets, curtains and new duvet cover and pillows. His brand new Big Boy Bed is arriving tomorrow so he’ll be all grown up and out of this cot by the end of the week *sniff*. I might get round to taking some pics to blog when it’s all set up and finished. P.S. Just remembered. No salsa update from last week as Kendo didn’t make it back from work till late. I’m hoping to drag him back this week……… I suspect his heart’s not really in it though. Er, shouldn't the Slash related posts be on another blog?! :P I defo need to get over there and have a battle with the lovely one some time soon! hmmm... my first job was at a fast food joint. and yes, i called it a joint. i might have to write about it & break myself out of this little blogging break I seem to have taken. where exactly are you finding all these prompts anyhow?? Happy Birthday to the DH! GH sounds fun! I love the sense of humor in your writing! First job sounds tough! I don't think I could wait tables! You can see my first job on my blog! My first job - probably my fave job that I've ever had and I probably would do it again. I worked at some stables over the summer holls when I was 14. I had 2 horses at the time so when I wasn't mucking out and feeding horses I was riding and it was FAB! Yes I'd rather clean up horse crap than my house :P! Happy Birthday to Kendo, and awwww bless Egg man in a BBB - we moved Cam into his last week after he kept escaping the cot and the travel cot at Mum's this weekend. Still need to decorate it though - poor love spent his first night in his BBB with Charlotte's fairy bedding on it! My first job was at the age of 15 working Saturday's in a florist shop for the princely sum of £5!! I ended up working there full time for £25 a week for 40+ hours! Ha - we were hardy folk...no need of a minimum wage back then!! I'm sure I was better off then than I have been since though! Well done with GH--I tried it when we were visiting my IL's and didn't finish a song, even on Easy, LOL. Of course, there was a lot of competition from all the grown-up siblings there, so I didn't have much practice time (or that's my excuse at least). My first real job--working at the Chinese food stand at the county fair--probably 2 of my worst weeks in the working world. My boss was very demanding and yelled at me constantly and I was the only one who hadn't ever worked in food service, so I'm sure that I was making a few mistakes as I learned the job, but man, I didn't like her. I guess I did benefit from min. wage--think I made around $5/hr, and that was back in the day when US money actually amounted to something!